PC maker Lenovo today announced its first smart speaker with Amazon's voice-activated virtual assistant built in. Called the Lenovo Smart Assistant, the connected speaker integrates Amazon's Alexa Voice Services and offers the same speech-activated features as the Echo family of devices, but housed in a slightly redesigned unit. 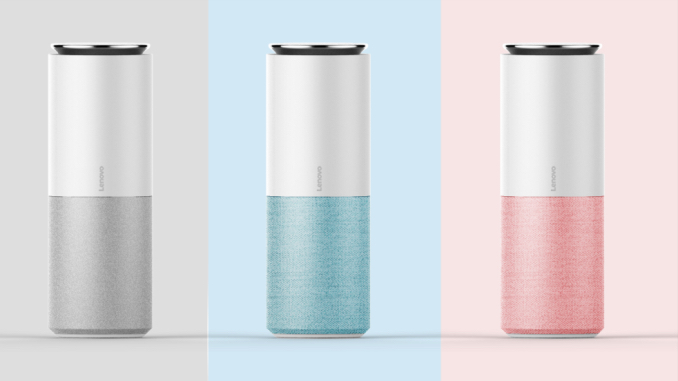 The speaker keeps the same cylindrical profile as Amazon's Echo, but with the microphone portion of the device in a slightly raised position, which Lenovo says offers better ventilation to cool the internal components. Lenovo's unit also has eight far-field microphones versus Echo's seven, with noise suppression and acoustic echo cancellation included for picking up voice commands from up to 16 feet away. The Lenovo Smart Assistant comes in a range of color schemes including green, gray, and orange fabric. The speakers will ship in May for a price of $130 (less than Amazon's Echo at $180). Lenovo is also offering a Harman Kardon edition of the Smart Assistant featuring better sound quality for $180. Amazon's Alexa Voice Services API is expected to crop up in a number of new third-party products at this year's CES. Microsoft has previously teased third-party devices using its own Cortana virtual assistant technology. I really don't see the appeal of these devices at all, I hope Apple does not waste any resources building a speaker of their own. Totally agree even the wife likes Alexa. One of my best purchases of last year. Siri supports 21 languages. Echo supports what....3? Amazon can't even deliver the product Globally because they don't have the support. I think it's a fair assumption Apple is working on their version of a home assistant. Apple is typically late in releases, but they will deliver a premium product with features other competitors didn't execute. Leave it to Apple and you know it will sell. Guaranteed. I'm waiting to see what they bring to the market. Likely sooner than later. I didn't like the idea of a little spybot in the house but I relented and got the Echo and Echo dot that were on my husband's Christmas wish list and I am glad I did. Alexa is a lot of fun and often useful and we all love her funny little "It's Raining in the Cloud" song. But I still rely on Google Assistant (in my Allo app on iPhone and on my Android phones) for better answers or any answers at all when Alexa doesn't know how to answer me and Siri completely mangles my question into something absurd and unrelated. I am impressed by how well Alexa seems to work with ordinary colloquial speech. I'm so used to speaking so precisely and robotically to Siri. I think apple must be working on this. With the death of the Airport express they now no longer have an audio airplay product. An Echo style solution for Siri would fill that gap. I just wish they'd hurry up as I might end up getting an echo! Honestly, I love these devices except for the privacy issue. By no means am I about to allow google or amazon to have an always-available microphone in my house.